The official title was King of Kings, but the locals just called it Touchdown Jesus. 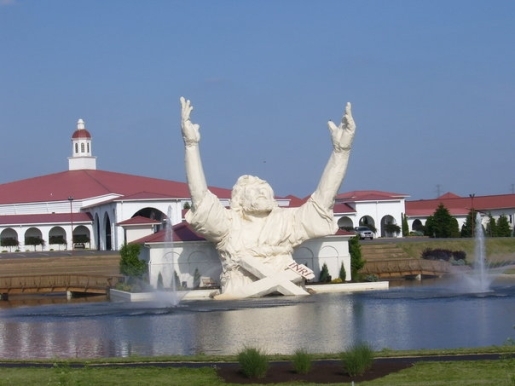 King of Kings was a six-story-tall statue of Jesus with his arms raised that sat outside the Solid Rock Church along I-75 in Monroe, Ohio. It’s been in place since 2004 and has become something of a novelty thanks to its construction, which was a steel frame covered in plastic foam and fiberglass. Emphasis on was, because after a round of storms on Monday, Touchdown Jesus has burned to the ground. Originally I thought the story was a reference to Touchdown Jesus at Notre Dame Stadium getting hit by lightning, but then I remembered that it’s hard to burn down just a mural without burning down the building around it, and that the building hosting Touchdown Jesus on Notre Dame’s campus is brick. There’s just something about giant sculptures that makes them fire magnets, though the straw goat burns much better than fiberglass and foam. I’d imagine when Touchdown Jesus went up, the smell was awful. It’ll take more than 3 days, but hopefully King of Kings will make a comeback, as it was a really cool statue.